Fifty people recently gathered at the Port Austin Fire Department’s annual Christmas celebration for active and retired members. The highlight of the event was an award presented to Bob Upthegrove for his commitment to the department. Chief Don Zimmerman announced the Golden Axe award, which is for 50 years of outstanding service, was the first ever given by the department. 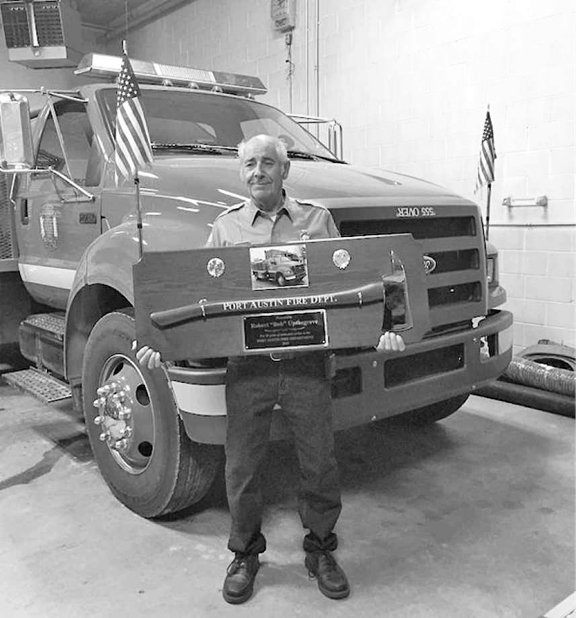 The plaque’s statement read: Presented to Robert "Bob" Upthegrove for 50 years of dedicated service to the Port Austin Fire Department 2018." Many of Bob’s family members have followed the proud tradition of serving as firefighters. His grandfather, Henry Clay Soward joined the city of Flint’s fire department in 1925, and served 22 years until he suffered a massive heart attack while enroute to a fire. His health forced him into retirement and the department retired his number. Bob’s father, John “Jack” Upthegrove, served as chief of the Port Austin Fire Department for many years during his 54 years, from 1948 until he passed in 2002. Nephew Robert “Bobby” Jahns was also a member of the department for eight years, from 1988 to 1996. Brother Dave Upthegrove, retired from the Otisville Fire Department in 2015 after 35 years. He too was honored with a Golden Axe award, plus they re-named the fire hall, “The David G. Upthegrove Fire Station.” Dave’s son, David, retired this year after serving with his father for 30 years and his brother, Brian, who has 23 years of service, is still active with the department. Bob’s son, Ryan joined Port Austin’s Fire Department in 2003 to follow his many family members in service to his community. He continues to respond to the Elkton and Port Austin departments as he is needed. The Upthegrove family has contributed a total of 234 years of saving lives and property in the honorable profession of firefighters. I would like to pass along that everyone with the Port Austin fire department wishes all of you enjoy a Merry and SAFE Christmas.